They say “the nose knows,” but I say the nose can be confused. Chlorine odors are a good example. Several different chlorine odors can arise from various chlorine-based substances and in different circumstances. They are not all simply due to “chlorine.” A prime example is the irritating smell commonly attributed to chlorine around some poorly managed swimming pools. That smell is from a couple of chemical compounds in the chloramine family. 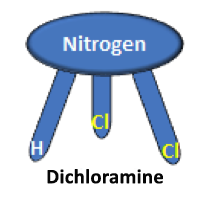 Some chloramines form when chlorine disinfectants react chemically with nitrogen-based substances from the bodies of swimmers, including urine. The poolside pronouncement of “too much chlorine in the pool” may be more aptly described as “too much peeing in the pool.” Ironically, the odor could signal that more chlorine is needed in the pool. 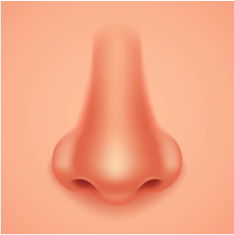 The nose is an extremely sensitive “detector” that sends information to the brain where it is interpreted. 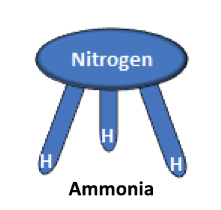 the “seat” and a hydrogen atom at the end of each “leg.” Ammonia is common in the environment, and although household ammonia has a very sharp odor, ammonia has no odor at the very dilute levels typically found in water. When chlorine is added to water in sufficient amounts, it breaks ammonia down into nitrogen (N2) gas and hydrogen (as water or H2O). But if the amount of nitrogen increases (from peeing in the pool, for example), the balance between chorine and nitrogen is disturbed and the ammonia is only partially deconstructed. When three chlorine atoms replace the hydrogen atoms on the ammonia molecule, the resulting compound is trichloramine, a pungent, irritating compound that is often mistaken for “too much chlorine” in the pool, even at very low concentrations. 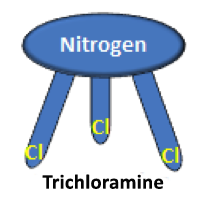 Trichloramine and its sister chemical dichloramine (with two chlorine atoms and one hydrogen forming the “legs”) are responsible for the odor you might smell when you enter an enclosed pool area in which there is poor airflow through the building. Besides just smelling bad, these same two chemicals can also turn swimmers’ eyes red. The problem with trichloramine and dichloramine goes beyond that irritating smell. When trichloramine is present in the pool, the level of “free chlorine” available to disinfect the water and protect swimmers from microbial disease is greatly diminished. That’s why it’s important to check pool water regularly for the pH and the presence of free chlorine1. Pool managers are obliged to do just that, and pool patrons can do the same with easy-to-use pool test strips. 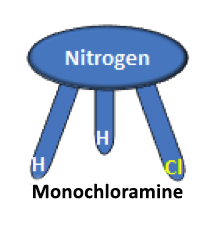 Trichloramine and dichloramine have a third sister – monochloramine. As the name suggests, in this compound, only one of the hydrogen atoms on the ammonia has been replaced with chlorine. This chemical, however, carries no odor and is an effective disinfectant that has been used successfully by many water treatment plants for many decades. What a difference a minor change in a chemical formula can make! Monochloramine is typically formed in source water by first adding chlorine to break down any ammonia (into nitrogen and water) and then adding back trace amounts of ammonia in carefully monitored amounts to produce only monochloramine. Unlike the chloramine family of compounds, chlorine bleach is a solution of water and sodium hypochlorite with the chemical formula NaOCl [bleach contains sodium (Na), oxygen (O) and chlorine (Cl)]. The odor of bleach (bleach that is not infused with a fragrance) is not nearly as pungent as that of di- and trichloramines. When the chlorine in bleach combines with nitrogen-based substances, however, smelly di- and trichloramines can form by chemical reaction. This could happen in the swimming pool environment, for example. Chlorine is a common, naturally occurring element, but due to its reactivity, it usually occurs in nature combined with other elements, such as sodium in common table salt, NaCl. It is also produced industrially as part of the “chlor-alkali” process in which both chlorine and sodium hydroxide (NaOH) are generated by applying electricity to salty water. In that process, chlorine is produced as a gas consisting of twin atoms chemically bound together, and is represented by chemists as “Cl2.” Both chlorine and sodium hydroxide are used to help produce hundreds of everyday products, including water treatment chemicals, PVC pipes, pharmaceuticals, paper, aluminum, silicon chips for computers and even the titanium metal used in joint replacements. Chlorine gas is a respiratory irritant that the human nose can detect at very low levels (0.2-0.4 parts per million in air; just for reference, one part per million is equivalent to four drops of ink in a 55-gallon barrel of water). At these low concentrations, chlorine gas smells very much like household bleach. When levels rise to the range of 1-3 ppm, however, mild mucous membrane irritation is noted and higher level exposure becomes increasingly dangerous.2 That is why the chlor-alkali industry takes extensive measures to ensure the safe production, handling and transportation of chlorine gas and even the less reactive sodium hypochlorite and calcium hypochlorite. Chlorine is a reactive element that is found in many different compounds exhibiting different but sometimes similar properties, including odor. It is credited to have dramatically improved public health over the past 100 years through its ability to disinfect water. I hope this discussion helps to clarify “the smell of chlorine.” Now your nose knows! Stephan A. Hubbs retired from water treatment operations at the Louisville Water Company in 2004. He was involved in the development of the first chlorine by-products regulation in 1975-1979 and remains an active volunteer in the drinking water community today. 1 Hypochlorous acid, or HOCl, for you chemists! 2 The Chlorine Institute, Inc., Pamphlet 63: First Aid, Medical Management/Surveillance and Occupational Hygiene Monitoring Practices for Chlorine, Edition 8, June, 2011.